by Raj Kanwar Dehra Dun’s famed Indian Military Academy will now depute its instructors to train gentlemen cadets at the Royal Indian Military Academy at Sandhurst (Surrey) in England. This new development comes both as a surprise and irony inasmuch as our erstwhile British rulers had always considered their Sandhurst Academy as the best in the world, and did everything in their power to discourage introduction or setting up of a training academy for Indian officers. The 1857 uprising by “native” sepoys against the despotic bosses of the East India Company compelled the British government to take over the direct administration of the territories then under the Company. It thoroughly restructured the British army in India following the recommendations of the Peel Commission. Thus, the crème de la crème of the British army officers were deputed to India to command British Indian Army that mostly comprised the natives; Indian officers were simply “No No”. This pattern continued for a long time and the army of Indian soldiers and commanded by British officers admirably served the purpose and won many a battle against local Rajas and Nawabs. This British Indian Army also performed heroically in World War I. However, in the beginning of the 20th century, a strident demand started emerging about the induction of Indian officers in the British Indian Army. This demand further grew, and then the Indian nationalist leaders increasingly realized the utmost necessity of handing over the command of the British Indian Army to Indian officers. This change, however, came about gradually and most reluctantly. It was a victory of sorts for Indian public opinion that the British government finally agreed to the setting up of a military academy for the training of Indian officers. In the meantime, some Indians from royal families and landed gentry were given commission and were sent to Sandhurst in Surrey, UK. The Indian Military Academy, which was initially nicknamed “Indian Sandhurst”, was set up on October 1, 1932. The first commandant was Brig. LP Collins. Forty gentlemen cadets, called the “Pioneers” joined the first course. Some prominent names among them were SHFJ (Sam) Manekshaw (India), Smith Dun (Burma) and Mohd Musa (Pakistan); all of them later became the army chiefs in their respective countries. However, the formal inauguration of the academy took place a little later on December 10, 1932, and Field Marshal Sir Philip Chetwode, Baronet, the then Commander-in-Chief in India, performed this historic and auspicious ceremony. The first five commandants of the IMA were the British and so were most of the officer-instructors. It was only in November 1947 that Maj-Gen. Mahadeo Singh was appointed as the first Indian commandant. A road near Ballupur has been named after General Mahadeo Singh. Reverting to the latest decision about exchanging Indian and British instructors should be considered a feather in the cap of the Indian Military Academy, and a testimony to its excellent training standards and traditions. This bilateral arrangement should bring about a degree of bonhomie between the two academies. It will obviously be for the first time that the Royal Military Academy at Sandhurst will have Indian instructors in the rank of captain. Thus, life has come full circle for IMA. It will also be a new experience for the Indian Military Academy which will now have British instructors for the first time since Independence. Ajay Banerjee/TNS New Delhi, December 10 The Ministry of Defence is under fire from a Parliamentary Standing Committee, which has “expressed concern” over “wasteful expenditure” and has slammed it for “sidetracking” the issue of having an independent regulator to manage the vast defence lands across the country. 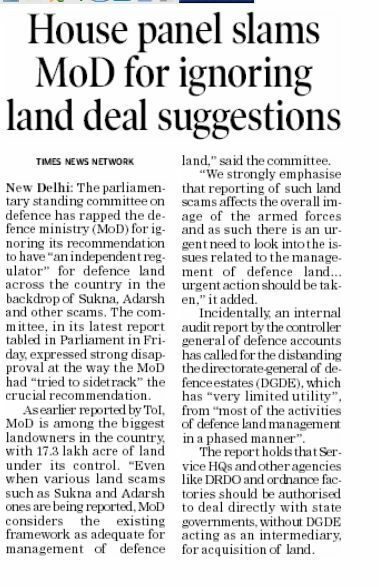 “Despite various land scams such as Sukna, Adarsh being reported, the ministry considers the existing framework as adequate for management of defence land,” remarked the 30-member committee. Birender Singh, an MP from Haryana, today tabled the report, which reiterated its earlier recommendation to have an “independent regulator” for management of defence lands and suggested “urgent action.” The committee observed that reports of land scams affect the overall image of the armed forces. It rejected the argument of the ministry that adequate provisions were available under the Cantonments Act, 2006, Cantonment Land Administration Rules, 1937 and Acquisition, Custody and Relinquishment etc of Military Lands in India Rules, 1944. 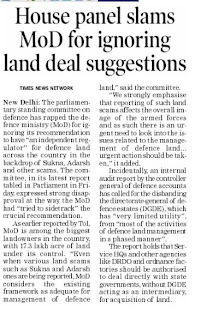 Notably, some 11,000 acres of defence land in the country has been illegally occupied. The ministry holds 7,000 sq km of land across India. On wasteful expenditure, the committee said it was “perturbed” to note that the ministry was still “examining” a report of the Defence Expenditure Review Committee. The ministry has informed that the task of examination and implementation of the recommendations has now been entrusted to officers of the level of Joint Secretary in the Ministry of Defence and Defence Finance. Tribune News Service Chandigarh, December 10 Taking serious note of the failure of the Kendriya Sainik Board to obey its orders, the Punjab and Haryana High Court has imposed costs of Rs 10,000 besides initiating contempt proceedings against the secretary, Kendriya Sainik Board (KSB) as well as its Joint Director. The KSB officers neither filed their reply for four consecutive dates nor did they appear before the court when summoned in a case pertaining to quota in seats in medical colleges for wards of disabled Armed Forces personnel. Antarpreet Kaur, wife of a Naib Subedar belonging to Gurdaspur who had been rendered invalid and was out of the Army on medical grounds in 1997, had challenged provisions of the policy that laid down the eligibility criteria. The court also ruled that the Union of India was liable to compensate the petitioner if any harm was caused due to the action of the respondents. Citing the WikiLeaks cables, major Pakistani newspapers this morning carried stories that purported to detail eye-popping American assessments of India's military and civilian leaders, the Guardian reported. Source : ANI Fri, Dec 10, 2010 11:56:32 IST Views: 21 Comments: 0 Rate: 1 out of 5 2 out of 5 3 out of 5 4 out of 5 5 out of 5 0.0 / 0 votes THE WHISTLE blower website WikiLeaks is being exploited for propaganda purposes against India by Pakistani newspapers, which have published fake cables attacking the Indian Army. Citing the WikiLeaks cables, major Pakistani newspapers this morning carried stories that purported to detail eye-popping American assessments of India's military and civilian leaders, the Guardian reported. According to the reports, US diplomats described senior Indian generals as vain, egotistical and genocidal, said that the Indian government is secretly allied with Hindu fundamentalists, and also claimed that Indian spies are covertly supporting Islamist militants in Pakistan's tribal belt and Balochistan. "Enough evidence of Indian involvement in Waziristan, Balochistan," read the front-page story in the News, while an almost identical story appeared in the Urdu-language Jang, Pakistan''s best selling daily. If accurate, the disclosures would confirm the worst fears of Pakistani nationalist hawks and threaten relations between Washington and New Delhi, but they are not accurate, the paper said. An extensive search of the WikiLeaks database by the Guardian by date, name and keyword failed to locate any of the incendiary allegations, suggesting that this is the first case of WikiLeaks being exploited for propaganda purposes. The News carried a report saying that a leaked cable from US Embassy in Islamabad disclosed that there were enough evidences of Indian involvement in Waziristan and other tribal areas of Pakistan as well as Balochistan. “An earlier cable described Indian Army involved in gross human rights violations in Indian-held Kashmir while some Lt Gen HS Panag, the then GOC-in-Chief of the Northern Command of the Indian Army, was equated with General Milosevic of Bosnia with regard to butchering Muslims through war crimes,” reported The News. It also said that another cable indicated “involvement of top Indian Army leadership in engaging Hindu extremist militants to carry out certain terror operations to keep Indian Muslims on the back foot and to keep pressure on neighbouring Pakistan’s Army and intelligence agencies, particularly the Inter-Services Intelligence.” Shaheen Sehbai, group editor at the News, described the story as "agencies'' copy" and said that he would investigate its origins. The controversial claims, published in four Pakistani national papers, were credited to the Online Agency, an Islamabad-based news service that has frequently run pro-army stories in the past, the Guardian said. 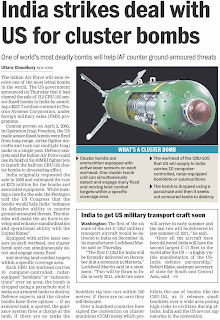 While in the west, reports have focused on US worries for the safety of Pakistan's nuclear stockpile, or the army's support for Islamist militants such as the Afghan Taliban and Lashkar-e-Taiba, the group blamed for the Mumbai attack, Pakistan's media has given a wide berth to stories casting the military in a negative light, focusing instead on the foibles of the country''s notoriously weak politicians, it added. The lopsided media coverage highlights the strong influence of Pakistan's army over an otherwise vigorous free press, the Guardian said. This morning's stories disparaging Indian generals is counterbalanced by accounts of gushing American praise for Pakistan''s top generals. However, the actual WikiLeaks cables carry more nuanced portraits of a close, if often uneasy, relationship between the US and Pakistan''s military, it added. Saturday, December 11, 2010 WASHINGTON: Indian army chief General Deepak Kapoor told US National Security Adviser James Jones Pakistan is home to 43 terrorist camps, out of which 22 are located in Azad Kashmir, according to confidential US diplomatic cables leaked by whistle-blower website WikiLeaks. During the meeting on June 26, General Kapoor said although the Pakistanis raided some camps in the wake of 26/11, some camps have reinitiated operations. ‚ÄúKapoor further asserted infiltration across the Line of Control (LoC) cannot occur unless there is some kind of assistance and/or degree of support that is institutional in nature. He described several incidents of infiltration that occurred this year, including that of 40 terrorists in March who were found possessing significant ammunition and other equipment. India is worried, Kapoor said, that some part of the huge US military package to Pakistan will find its way to the hands of terrorists targeting India,‚Äù said the leaked cable. According to another leaked cable, Chinese officials reacted furiously to Australia’s plans to expand its defence force in part to counter the Asian giant’s growing military presence. Cables published in part in the Sydney Morning Herald revealed that one official had warned Canberra it would “suffer the consequences” if comments about China in a 2009 defence planning document were not altered. The US diplomatic cables state that then senior Australian defence official Mike Pezzullo was met with a frosty reception by Chinese officials whom he briefed about the defence paper before its release. The cables date from May 2009, the same month in which the defence paper urged an expansion of Australia’s air and naval capability in response to a regional military build-up and shifts in power. China chose to make an example of Nobel Peace Prize winner Liu Xiaobo by jailing him for 11 years last year during a wider crackdown on dissidents, Spain’s El Pais newspaper said, citing US diplomatic cables. The cables reported Beijing increased pressure on dissidents last year due to concerns of renewed civil unrest coinciding with the 20th anniversary of the Tiananmen Square protests and the 50th anniversary of the occupation of Tibet. At that time, the global financial crisis had already fuelled social conflict, the like of which China had not seen for a long time, the cables said. The cables also highlighted the Beijing’s anger at protests over Liu’s sentence around the world, particularly in Washington and some European capitals. Australia’s former prime minister Kevin Rudd confessed that the bloody conflict in Afghanistan “scares the hell out of” him, newly leaked diplomatic cables revealed. Rudd, currently foreign minister, was revealed in confidential US diplomatic cables from Canberra to have confided his pessimism over the likely outcome of the conflict, in which 1,550 Australian troops are engaged. Rudd also derided the contributions of Germany and France in Afghanistan in fighting Taliban insurgents, saying they were “organising folk dancing festivals” while Australians fought in restive Uruzgan province. According to another leaked cable, dockworkers and foreign businessmen have seen evidence of alleged secret nuclear and missiles weapons sites being built deep in the Myanmar jungle. “The North Koreans, aided by Burmese workers, are constructing a concrete-reinforced underground facility that is ‘500ft from the top of the cave to the top of the hill above’,” according to the cable, published by the British daily The Guardian. The cable from the US embassy in Rangoon quoted a Myanmar officer who said he had witnessed the North Korean technicians helping the construction work. One foreign businessman told the embassy that he had seen reinforced steel bar, larger than for just a factory project, being shipped on a barge. While dockworkers also told of seeing suspicious cargo. A cable dating from August 2004 revealed information from a Myanmar officer in an engineering unit who said surface-to-air missiles were being built at a site in a town called Minbu in west-central Myanmar. He said some 300 North Koreans were working at the site, although the US cable noted this was improbably high, The Guardian said. Mozambique has become a leading drug trafficking centre in Africa, with high-level government officials receiving bribes to turn a blind eye to the trade, according to another leaked cable. “Despite anti-corruption rhetoric, the ruling FRELIMO party has not shown much serious political will to combat narco-trafficking,” said a secret US document from Maputo created in January 2010. A separate classified document released on WikiLeaks said drug producers from South Asia have joined the fray and are starting to traffic in Mozambique through its Nacala port. “Mozambique most certainly is not yet a thoroughly corrupted narco-state,” a document from November 2009 said. Another leaked diplomatic cable said China is fed up with the “foot-dragging” of the military junta in Myanmar on reform and fears the ruling generals can no longer protect its interests in the country. “The Chinese clearly are fed up with the foot-dragging by the Than Shwe regime,” the top US diplomat in Yangon, Shari Villarosa, wrote in a January 2008 memo summarising a meeting with the Chinese ambassador at the time. “The Chinese can no longer rely on the generals to protect their interests here, and recognise the need to broker some solution that keeps the peace,” she wrote, following mass street rallies in 2007 that ended in bloody violence. “The Chinese ambassador no longer tried to defend the regime, and acknowledged that the generals had made a bad situation worse,” she said. K.P. 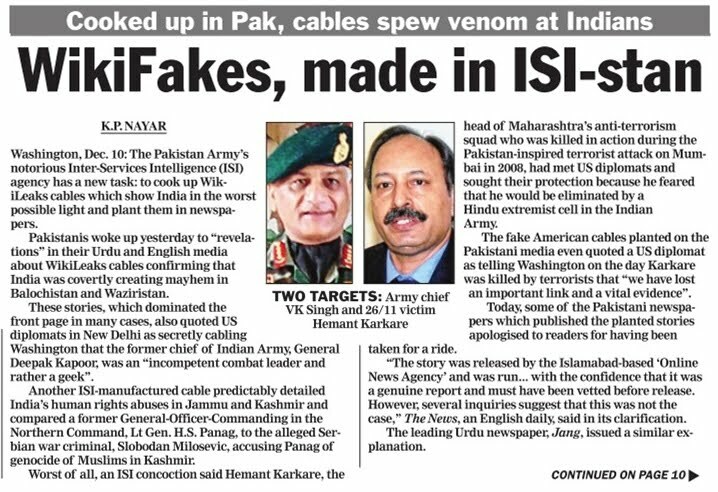 NAYAR Two Targets: Army chief VK Singh and 26/11 victim Hemant Karkare Washington, Dec. 10: The Pakistan Army’s notorious Inter-Services Intelligence (ISI) agency has a new task: to cook up WikiLeaks cables which show India in the worst possible light and plant them in newspapers. Pakistanis woke up yesterday to “revelations” in their Urdu and English media about WikiLeaks cables confirming that India was covertly creating mayhem in Balochistan and Waziristan. 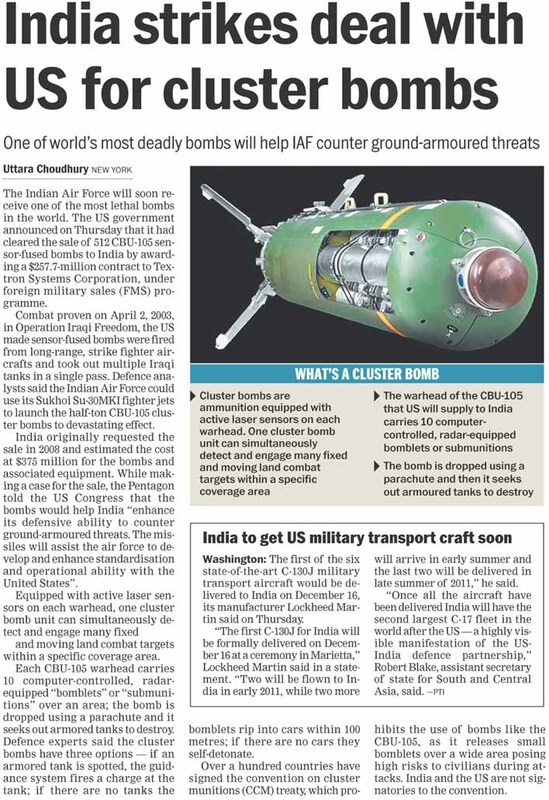 These stories, which dominated the front page in many cases, also quoted US diplomats in New Delhi as secretly cabling Washington that the former chief of the Indian Army, General Deepak Kapoor, was an “incompetent combat leader and rather a geek”. Another ISI-manufactured cable predictably detailed India’s human rights abuses in Jammu and Kashmir and compared a former General-Officer-Commanding in the Northern Command, Lt Gen. H.S. Panag, to the alleged Serbian war criminal, Slobodan Milosevic, accusing Panag of genocide of Muslims in Kashmir. Worst of all, an ISI concoction said Hemant Karkare, the head of Maharashtra’s anti-terrorism squad who was killed in action during the Pakistan-inspired terrorist attack on Mumbai in 2008, had met US diplomats and sought their protection because he feared that he would be eliminated by a Hindu extremist cell in the Indian Army. The fake American cables planted on the Pakistani media even quoted a US diplomat as telling Washington on the day Karkare was killed by terrorists that “we have lost an important link and a vital evidence”. Today, some of the Pakistani newspapers which published the planted stories apologised to readers for having been taken for a ride. “The story was released by the Islamabad-based ‘Online News Agency’ and was run... with the confidence that it was a genuine report and must have been vetted before release. However, several inquiries suggest that this was not the case,” The News, an English daily, said in its clarification. The leading Urdu newspaper, Jang, issued a similar explanation. The fakes may never have been exposed if The Guardian of London, one of about half-a-dozen media outlets vetting, editing, interpreting and publishing the WikiLeaks cables from Day One of their release, had not investigated the sensational anti-Indian plants which created ripples in the diplomatic community in Islamabad. “An extensive search of the WikiLeaks database... by date, name and keyword failed to locate any of the incendiary allegations. It suggests this is the first case of WikiLeaks being exploited for propaganda purposes,” The Guardian announced as part of yesterday’s release of genuine WikiLeaks cables. It asked one of the Pakistani editors who published the fake cables and was told it was “agencies” copy. “The editor promised to investigate its origins.” Reflecting a grim Pakistani reality, The Guardian quoted a blogger as writing that in Pakistan, “agencies” can mean both a news agency and a spy agency that indulges in activities it would not dare to do in a genuine democracy. The Islamabad correspondent of The Guardian wrote that the “Online News Agency” is an Islamabad-based news service that has frequently run pro-army stories in the past. Therefore, the presumption that the army and the ISI are behind the latest plant as well. 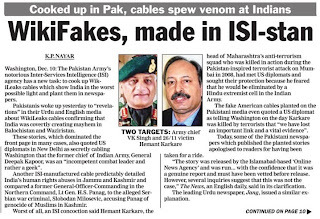 The obsession with the Indian Army in the fake cables was also a giveaway. In Pakistan, the defence forces are the most important institution determining the fate of Pakistanis, but in India that is far from being the case and yet, US diplomats in New Delhi are shown in the ISI concoctions as focusing heavily on the army as they would in Islamabad. In a reference to the present chief of India’s army staff, Gen. V.K. Singh, a cable purportedly from the US embassy in New Delhi “mentioned General Singh as an egotist, self-obsessed, petulant and idiosyncratic general, a braggadocio and a show-off, who has been disliked (and barely tolerated) by all his subordinates”. Another cable “urged Washington to secretly divert UN attention towards the genocide of innocent civilians in Indian-held Kashmir at the hands of Indian Army and also suggested that US should avoid holding any joint drill with Indian Army until it stops inhuman activities in Kashmir”. Common sense should have told any Pakistani editor handling this plant that since Washington had acted against every piece of advice purportedly given by its diplomats in New Delhi, the story should have been suspect. The fact that Pakistani editors willingly suspended disbelief could lend credence to a theory that they may have been part of such disinformation, which was exposed only because of diligence on the part of The Guardian. Yet another fake cable described India’s “Hindutva brotherhood as a far bigger threat to regional and global peace than the Taliban, al-Qaeda and the Lashkar-e-Toiba and the latter three were declared as ‘peanuts’ if equated with Hindutva brotherhood and Sangh Parivar and Washington was urged to take up the issue with New Delhi”. In their sychophancy, the ISI fakers in Rawalpindi did not fail to plant a cable that praised their boss. “The Inter-Services Intelligence (ISI) chief Ahmed Shuja Pasha’s extension in service was termed as a good omen (for the US) in one such cable and it was added that his further presence on the scene would enhance the agency’s abilities to combat anti-terror war.” If yesterday’s plant had gone undetected, it would have taken away some of the severe sting for Pakistan from the genuine WikiLeaks cables. They have portrayed Islamabad’s civilian leadership and bumbling, corrupt and incompetent and the ISI as double-dealing. By painting India as the villain, the fake cables sought to at least show India in the same, if not worse, light on issues like human rights, regional hegemony and religious militancy. Ajai Shukla / New Delhi December 11, 2010, 0:17 IST A barrage of damning revelations have raised troubling questions about India’s best-respected institution. But is there even a semblance of an effort to confront or acknowledge, let alone fix the problem On April 27, 2007, while a dazed United States military was being battered by the resurgent insurgency in Iraq, a mid-ranking US Army officer, Lieutenant Colonel Paul Yingling, published a brutally frank assessment of the failures in American generalship that had led to the bloodying of the world’s most powerful military machine. Writing in the Armed Forces Journal, a private magazine focused on defence, Yingling urged the US Congress to fix accountability for the debacle in Iraq, lamenting that, “As matters stand now, a private who loses a rifle suffers far greater consequences than a general who loses a war.” Yingling’s article raced across army chat rooms, combat bases in Iraq and Afghanistan, and military seminar halls. Hard-hitting, incisive, and loaded with statements like, “The intellectual and moral failures common to America’s general officer corps in Vietnam and Iraq constitute a crisis in American generalship,” the analysis pushed America’s senior military leadership towards acknowledging, confronting and acting to fix the problem. India’s armed forces, alas, have neither a Paul Yingling nor a culture of interrogating and addressing serious internal problems. With revelation after damaging revelation — including financial misappropriation, sexual misconduct, fake encounters and influence-peddling — placing troubling question marks over the internal health of India’s best-respected institution, not a single serving officer has thrown out a Yingling-style challenge. Rot at the top? This silence has endured even through the recent revelations about the improper allocation of multi-crore apartments in Mumbai’s tony Colaba area to a bevy of generals and admirals. The Adarsh Housing Society affair, which has riveted the country’s attention, is not just about the apparent abandonment of ethics by three service chiefs and five officers of three-star rank. Worse, it is about the alleged subversion of army postings to keep Major General Tej Kishen Kaul in Mumbai so that he could keep the file moving while a succession of key military commanders in Mumbai and Pune were handed out flats, allegedly in exchange for their silence. “Corruption exists mainly within the senior ranks,” avers Major General Afsir Karim, a retired paratrooper with a reputation for probity. “Bad apples manage to get into the organisation… after all, the (military’s) selection system has no psychological check for integrity. As the officers rise and start getting opportunities to make money, they surround themselves with a coterie of staff officers and subordinates who are quickly subverted… the corrupt pull each other up within the system. And from them the rot spreads to other parts of the military.” Echoing this assessment is a former army commander, well-known for his honesty, who ran afoul of his boss after instituting an inquiry into evidently corrupt purchases of equipment. He describes the insidious disillusionment of idealistic young officers who gradually realise that the values that were catechised during their training are hardly reflected in day-to-day unit life. In their training academies, officer cadets are indoctrinated with Field Marshal Chetwode’s motto: “The safety, honour and welfare of your country come first, always and every time. The honour, welfare and comfort of the men you command come next. Your own ease, comfort and safety come last, always and every time.” On being commissioned into their units, however, these young lieutenants often encounter a different reality. An increasing number of units in peace stations focus less on training than on “career-enhancing” activities like officers’ mess parties and ladies’ club functions, which commanding officers believe would please their bosses or, even better, their bosses’ wives. Meanwhile, youngsters who are posted to the field, or to counter-insurgency operations, come up against a pressure-cooker insistence on success at all costs; after all, the promotions of bosses all the way up the line hinge on operational accomplishment. With so much at stake, fake encounters and false reports are desperate options for creating an illusory world of success. ‘Five-star’ culture Old-school generals say that this new environment of flexible morals and professional dishonesty has inevitably spilled over into the handling of money. Traditionally indifferent, even disdainful, towards money, senior officers are now developing a yen for what the military has always disparaged as the “five-star culture”. “The military had a culture of its own and never felt the need to imitate civilian lifestyles,” says General Karim. “You met civilians, even socialised with them, but you always came back to your mess life. Today, many senior officers want a lifestyle that cannot be supported by military pay and allowances.” Rising alongside the appetite for money, has been the opportunity to gather it illegally. “The money that an officer handles rises exponentially as he is promoted up the chain,” explains a former army commander who prefers to remain unnamed. “With defence budgets boosted by a growing economy, each of the six field army commanders oversees budgets today that are in the hundreds of crores. 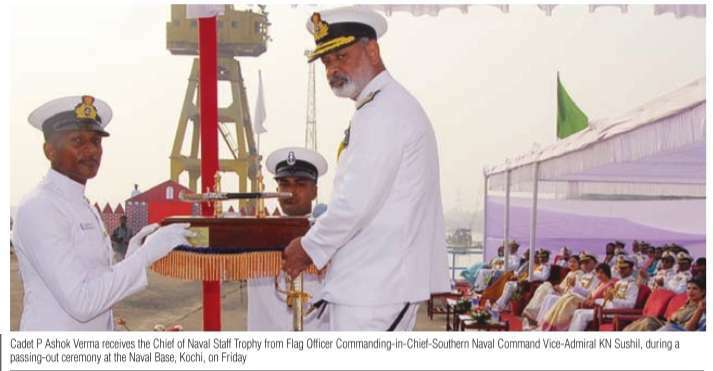 Take the example of the Udhampur-headquartered Northern Command, where the commander, a lieutenant general, controls an annual budget of Rs 2,500-2,700 crore. Large chunks of this are spent at his sole discretion, including “special financial powers” for Rs 100 crore, and another Rs 15-16 crore for obtaining intelligence about militants. “I could simply order my staff to give me Rs 20 lakh to pay a political source for important intelligence,” says the former army commander. “I wouldn’t need to provide proof that I had handed over the money to anyone. I could justify the expenditure simply by stating that I needed a political perspective.” Such opportunities for corruption abound. Northern Command’s budget for rations is about Rs 700 crore per year, with another Rs 100 crore allocated for hiring civil transport. The budget for operational works, i.e., constructing bunkers, lighting and temporary housing, is over Rs 250 crore. And, inexplicably, Northern Command has retained with itself — despite several attempts to transfer this responsibility to New Delhi — the job of buying rations for troops deployed on the Siachen Glacier, an annual expenditure of some Rs 40 crore. Other formations handle smaller budgets. But all these contracts come loaded with the potential to explode into public scandals. Lieutenant General R K Nanavatty, who headed Northern Command at the start of this decade and was feared and respected for his unwavering rectitude, says that he could see the current crisis coming: “I have always said that the biggest danger for our army was the gradual degradation of moral values. I could see morality eroding and this worried me because trust is the basis of military functioning.” Time for action A key concern among soldiers, serving and retired, has been the military’s lame defence in the face of credible allegations of wrongdoing like those around the Sukhna Land allocation and the Adarsh Housing Society scam. Many believe that frankly acknowledging the problem and taking exemplary action against corruption would protect, perhaps even enhance, the military’s public image. “Why should we wait for the civilian agencies to prove criminal guilt?” asks former army deputy chief, Lieutenant General G D Singh, widely respected for his integrity. “We have our own code of conduct, which does not rest on court orders or judgements. When an officer is clearly corrupt, we should ostracise him from our community; none of his peers should even speak to him; he should be treated as a pariah.” Considering that officers who were commissioned in the mid-1970s are generals, admirals and air marshals today, it is a paradox that the military often blames the changed background of those who now join as officers for the decline in values and standards. Far more likely, say the more discerning observers, is the “osmosis of values” that stems from increased interaction —across all ranks — with society in general. This takes place in many ways: cantonments, earlier located well outside towns and cities, are now almost indistinguishable from the rapidly expanding civilian colonies that have surrounded them. The army’s growing counter-insurgency commitments bring soldiers into close contact with civilians, and with the institutions of governance. Meanwhile, the growing reach and intensity of the electronic media beams the civilian world into the remotest military outposts. Most officers today are keenly aware of the world outside the barracks and are deeply cynical about the declining mores of civilian institutions. Officers, and even soldiers, ask: With the political class, the bureaucracy, the judiciary, the police and even the media deeply compromised, how can they point a finger at the military, an institution synonymous with honour and sacrifice? But underlying that question is a more troubling one: With corruption everywhere, is it possible for the military to remain unaffected? The current army chief, General V K Singh, publicly declared while assuming office last April that restoring the army’s “internal health” would be his focus. The general has his task cut out for him. December 11, 2010 8:17:16 AM PTI | Balasore (Orissa) A test-fire of an upgraded Agni-II nuclear-capable intermediate range ballistic missile from Wheeler Island off Orissa coast failed today with the weapon system deviating from its trajectory immediately after lift off. 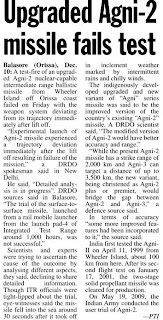 "Experimental launch of Agni-II missile experienced a trajectory deviation immediately after the lift off resulting in failure of the mission," a DRDO spokesman said in New Delhi. He said, "Detailed analysis is in progress". 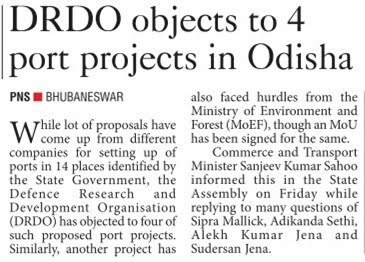 DRDO sources said in Balasore, "The trial of the surface-to-surface missile, launched from a rail mobile launcher from the launch pad-4 of Integrated Test Range around 1000 hours, was not successful". Scientists and experts were trying to ascertain the cause of the outcome by analysing different aspects, they said, declining to share detailed information. Though ITR officials were tight-lipped about the trial, eye-witnesses said the missile fell into the sea around 30 seconds after it took off in inclement weather marked by intermittent rains and chilly winds. The indigenously developed upgraded and new variant of 'Agni' series missile was said to be the improved version of the country’s existing 'Agni-II' missile. 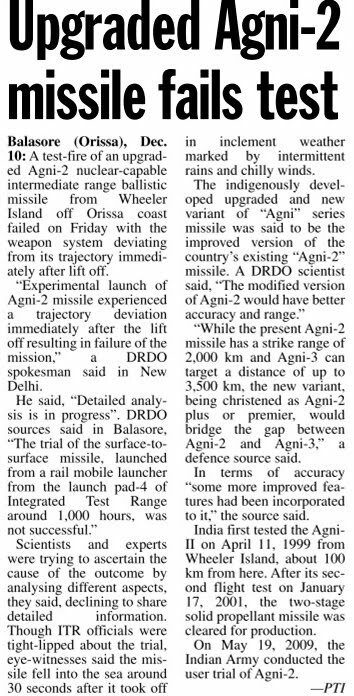 A DRDO scientist said, "The modified version of Agni-II would have better accuracy and range." "While the present Agni-II missile has a strike range of 2000 km and Agni-III can target a distance of up to 3500 km, the new variant, being christened as 'Agni-II plus or premier', would bridge the gap between Agni-II and Agni-III," a defence source said. In terms of accuracy "some more improved features had been incorporated to it," the source said. 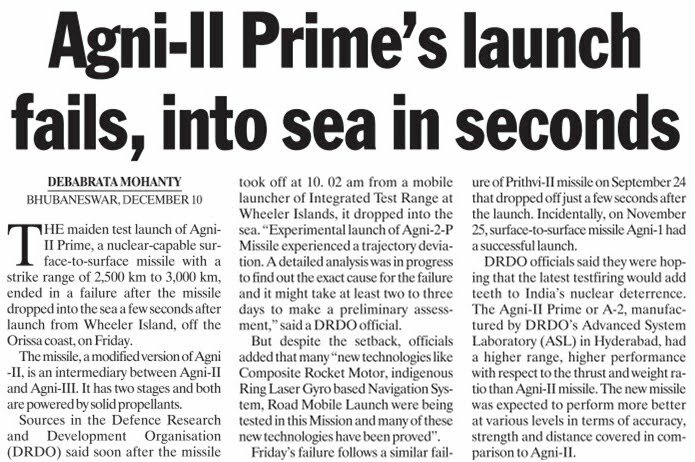 India first tested the Agni-II on April 11, 1999 from Wheeler Island, about 100 kms from here. After its second flight test on January 17, 2001, the two-stage solid propellant missile was cleared for production. On May 19, 2009, the Indian Army conducted the user trial of Agni-II. However, it ended in a failure. In a subsequent trial, conducted on November 24, 2009, the missile once again failed. After two successive failures, the flight test by the Indian Army carried out on May 17, 2010, was a success. 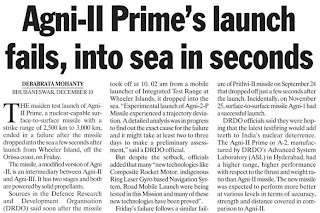 Agni-III was first flight tested on July 9, 2006, from the Wheeler Island off Orissa coast, but it was unsuccessful. However, the trials on April 12, 2007 and May 7, 2008 were successful and met all parameters. For the fourth time, the sleek missile was tested on February 7, 2010 and proved the weapon system's robustness and accuracy by a hat-trick of successful performances. The two-stage solid-fuel missile, meant for the country’s strategic nuclear deterrence, is now ready for induction. 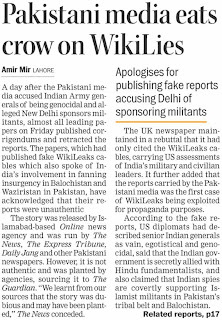 December 10, 2010 The defence ministry on Friday sought a report from the army on the fake WikiLeaks reports slamming India that emerged in the Pakistani media. The ministry has sought Army chief Gen V.K. Singh's comments on the hoax cables. Army sources told Headlines Today that such reports were expected from Pakistan and it was for the government to respond to them. The fake cables, which were published by Pakistani newspapers, have US diplomats making damning charges against the Indian government and calling Indian Army generals genocidal. The cables claim the US is worried about a Bosnia-like situation in Jammu and Kashmir. The newspapers also quoted the cables as saying that senior Indian generals were vain and egotistical and that the army leadership was divided. Another cable, the reports claimed, said that slain Mumbai ATS chief Hemant Karkare had briefed Americans about an alleged nexus between the India Army and 'Hindu fanatic groups'. The Guardian newspaper of UK nailed the lies. It carried out an extensive search of the WikiLeaks database but failed to locate any of these provocative cables. 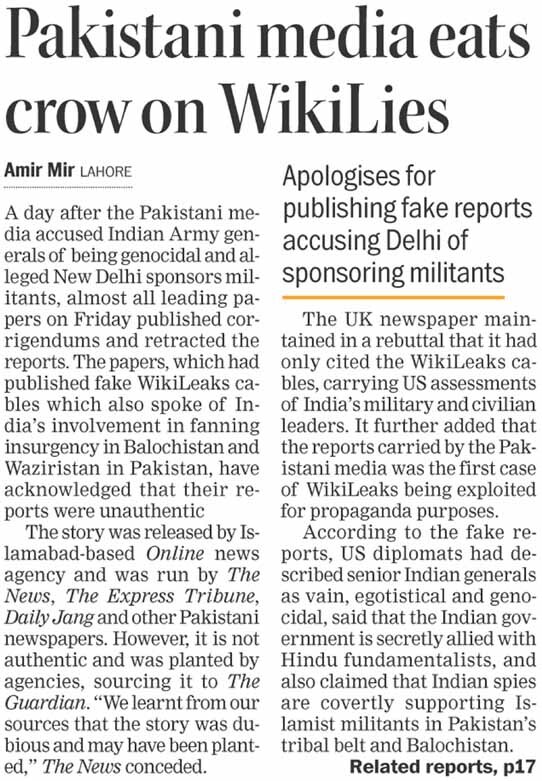 Comments Leading Pakistani newspapers, which had published fake WikiLeaks cables attacking the Indian Army for false propaganda, have acknowledged that their reports were unauthentic. December 10, 2010 - Islamabad Leading Pakistani newspapers, which had published fake WikiLeaks cables attacking the Indian Army for false propaganda, have acknowledged that their reports were unauthentic. The Express Tribune published an apology over its fake report, "WikiLeaks: What US officials think about the Indian Army", saying that "the story... was not authentic", and it "deeply regrets publishing this story without due verification and apologises profusely for any inconvenience caused to our valued readers." The News said that the "story filed by a news agency about purported WikiLeaks cables disclosing India's involvement in Balochistan and Waziristan, carried by The News, Daily Jang and many other Pakistani newspapers, has been widely criticised as not being accurate." "The story was released by the Islamabad-based Online news agency and was run by The News and Daily Jang with the confidence that it was a genuine report and must have been vetted before release. However, several inquiries suggest that this was not the case," the paper added. It said that when contacted, the owner of the agency, Mohsin Baig, and some of the editorial staff were "themselves unclear about the source of the story and said they would investigate the matter at their end." "On further inquiries, we learnt from our sources that the story was dubious and may have been planted," The News conceded. According to the fake reports, US diplomats had described senior Indian generals as vain, egotistical and genocidal, said that the Indian government is secretly allied with Hindu fundamentalists, and also claimed that Indian spies are covertly supporting Islamist militants in Pakistan's tribal belt and Balochistan. "Enough evidence of Indian involvement in Waziristan, Balochistan," read the front-page story in the News, while an almost identical story appeared in the Urdu-language Jang, Pakistan's best selling daily. The News had carried a report saying that a leaked cable from US Embassy in Islamabad disclosed that there were enough evidences of Indian involvement in Waziristan and other tribal areas of Pakistan as well as Balochistan. An earlier cable described Indian Army involved in gross human rights violations in Kashmir and Lt Gen HS Panag, the then GOC-in-Chief of the Northern Command of the Indian Army, was equated with General Milosevic of Bosnia "with regard to butchering Muslims through war crimes," reported The News. It also said that another cable indicated "involvement of top Indian Army leadership in engaging Hindu extremist militants to carry out certain terror operations to keep Indian Muslims on the backfoot and to keep pressure on neighbouring Pakistan's Army and intelligence agencies, particularly the Inter-Services Intelligence."